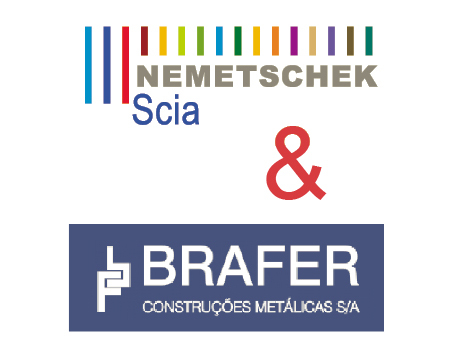 Brafer started in Parana state in 1976 and succeeded a continuous expansion with 2 factories today (one in Araucaria and one in Rio de Janeiro) and offices all over Brazil. With over 1,000 employees Brafer is delivering 30.000 ton of steel structures in South America to a variety of market segments, from buildings, over stadiums, industrial plants (on- and offshore), mining, paper-mills, warehouses, malls, towers and oil / gas installations. After the start of the 2nd factory in Rio, the Brafer management addressed the organizational pains it was experiencing daily: several different CAD systems in-house and by suppliers delivered steel fabrication details, to name a few: Tekla Structures, Strucad, Tecnometal and AutoCAD. Pasquale S. Garofani Tsingos (Technical director) expressed: “the large variety of structures, the multitude of manufacturing operations (including 25 CNC machines) and our spread over 2 factories forced us to rethink our logistics”. Several standalone applications were in use to manage machinery and drive manufacturing (incl. welding), our stock became expensively large causing issues in costs and efficiency. Brafer did a global search on integrated solutions to fundamentally change its IT support within the 2 factories. Visits to fabricators in Europe proved that an integrated approach, in which all aspects of manufacturing are managed, is possible if one has the courage to replace all “island” solutions with a common database architecture. The software Scia Steel Manager was chosen in 2009 after a period of intensive study and consultancy, it was implemented and extended since then. The software was installed on servers at the main factory in Araucária, with access to the factory in Rio de Janeiro, based on a terminal mode. The Scia Steel Manager software covers: importing data from CAD systems, bill of materials, fabrication lists with phases & batches, transport and loading phases, stock management and procurement, steering of operations on plates (incl. nesting for optimal cutting) and on beams & flats including appropriate postprocessors to steer the existing machinery of various origin. Detailed production planning was implemented with detailed estimation of production times, taking into account capacity and routing, for machinery and working staff. For costs and accounting, a direct link between Scia Steel Manager and the Brafer ERP software was added. The success of the implementation is due to the careful coordination as well at the side of Brafer as at the side of Scia with each having assigned a project manager. When needed the software was adapted to be aligned with well functioning processes in the factories. After the initial implementation period, quickly Brafer experienced significant advantages: the errors caused by production input were reduced, the stock became well managed reducing costs, better integrating the production chain and improving quality. Transport is managed, which gives enormous flexibility when a project is executed over the two factories. The replacement of individual machine steering by uniform 1D and 2D CAM software including cutting optimizations creates more flexibility when urgent repairs to one machine are necessary. To streamline the production at all stations (including manual welding) bar codes are implemented on production sheets. It has resulted in real time production management which yields – as an extra bonus – online management reports on materials, time and costs. Needless to say the Brafer has a prolonged ISO9001 quality label besides achieving and certifying on ISO14001 and OSHAS18001. With more than 50 simultaneous users of the software it needed time for implementation, training and adaptations, more time than originally planned. Yet the step by step use of the software, in agreed phases, was possible thanks to a careful roll-out of more functions of the manufacturing management software. As well Brafer as Scia look back to an intensive period of cooperation wherein both have gained experience. The project of automation is successful and is source of further extensions; in last year’s new machinery with combined operations (cutting, drilling) were added to the production chain and integrated in Scia Steel. As BIM (building information modeling) gets closer to production, 3D visualization as well for production management as for planning (from concept up to erection and maintenance) will be adopted. Based on a SQL database Scia Steel Manager manages steel fabrication project data, from planning, over fabrication to erection. The production data cover the Bill of Material, the full 3D geometry of the assemblies up to the smallest operations on the parts (e.g. holes, notches, welds, …). These data are coming from CAD systems (Tekla Structures, Strucad, SDS/2, Bocad, Tecnometal, …) or are entered manually. The main processes which are simulated are: planning resources (manpower, machinery), material management (stock, purchases) for profiles, plates, fixing articles and other, production management (what, how, where, when) with flexible production orders for positions and assemblies, steering machinery while optimizing 1D and 2D cutting by automatic nesting based on international standards or proprietary formats for a great variety of machines. High quality standards are pursued in applying the Scia logistics (production acceptance, welding certificates, stacking and delivery management, erection order visualization and monitoring (also with barcodes). Data on time and materials spent on simultaneously managed projects are linked to client specific ERP systems.